If you follow me on Instagram, you know that one of my main goals for 2019 is to take better care of myself and to be more selfish - I wrote a full post about what that means and you can read it right here! When it comes to self-care, one of my main go-to is taking care of my skin, hair, nails and body. Basically, anything that makes me look good makes me feel good… That’s why when I saw this Peter Thomas Roth Mask Frenzy set at Sephora right before the Holidays, my heart went nuts! You guys KNOW by now that I swear by this PTR Hungarian thermal water face mask, and when I saw this set of 6 masks, I felt like it was screaming my name. And like it was the perfect occasion to test out the other masks and see if they’re all as good as my beloved Hungarian thermal water mask. So I took out my wallet without hesitation and shelled out the $75 it cost to purchase this set. Actually, Sephora was having a 20% off sale, so I only paid $60 for these 6 masks, which is an AMAZING deal. I couldn’t leave it there, you know? While we’re talking about price, I feel like I need to mention the only thing that’s bothering me about this set, even though it means starting this review off on the wrong foot. When you buy it at Sephora, they tell you that the set is $75, but that it’s valued at $254. I was curious to see how they came to that amount, so I did the math… And it’s wrong. Basically, all the full-size Peter Thomas Roth masks are usually sold in 150ml jars (5oz). In the Mask Frenzy set, they all come in 50ml jars, which is exactly a third of the full sizes. 2 of their full-sized masks sell for $52, 3 sell for $58, and one sells for $80. If we divide all the full-size prices by 3, we get 2x 17.33, 3x 19.33 and 1x 26.66. Which totals 119.31. So $120. We’re pretty damn far from $254, even if we round up WAY UP. Now I would understand if Peter Thomas Roth sold smaller versions of their masks and it came out to be more expensive per ounce for the smaller packages. After all, they still have to manufacture packaging, ship it, market it, the whole shebang… BUT the brand DOESN’T sell smaller versions of their masks. They only sell one size, the full-size. So where is this $254 amount coming from? I don’t know. It’s more than twice the actual value per ounce based on the full sizes, and I personally find that kind of fishy. What really irks me about this is that paying $75 for these 6 masks (that to me, are worth $120) is already a GREAT DEAL. So why did they did to make it look sooo extravagant? I don’t know. Honestly, that’s kind of a turn-off for me, and I’m sure I’m not the only one who did this very simple math. As a consumer, I’m all for a great deal, but I don’t appreciate being lied to so blatantly. Now I’m not saying I won’t shop at Sephora anymore, hell I even bought the damn thing. I’m just saying in this particular case, it’s kind of a bad move, and I seriously doubt anyone from Sephora will be reading this, but if they did, I hope they would correct the situation, because this is just bad sales tactics. That being said… Let’s move on to the review of the actual product, shall we?! Obviously I’ve done a full review on this one before so I won’t go into all of it for the second time on here. This mask has been one of my favourite masks for months, and it’s still on the top of my list. It says it “replenishes and restores for smoother, younger looking skin” and I feel like that’s pretty close to what it does. To sum it up, I would say that when my skin looks “blah” and needs a little tszuj, that’s the mask I’m going for. It really feels like putting your face through a day at the spa… In 5 minutes. I also really appreciate the heating effect, that truly makes it feel like your skin is getting pampered on a deeper level. After using it, you ca expect your skin to look more even and definitely look rested. I honestly thought this would be my favourite mask of the set, because my pores are quite visible and it’s really the only thing that’s bothering me about my skin at this point (that and the one line on my forehead). Maybe my expectations were too high, but this mask was actually my least favourite of the set. It didn’t really change the look of my pores, but I feel like my pores look big because they’re just big… Not because they’re clogged or full of impurities. So maybe there wasn’t much the mask could do for me to begin with? I feel like this might be more for people struggling with acne, in which case it would help cleaning out the pores to prevent breakouts. So not to say that this mask wasn’t good, maybe it just wasn’t the most appropriate for my needs. So this mask is supposed be “refreshing, cooling and moisturizing” and to help “soothe the look of dry skin” and that’s EXACTLY what it does. Talk about a product that does exactly what it promises! This definitely feels like a “detox” product. I used it 3 times, once after our trip to Mexico, and twice after a day of drinking lots of champagne, when I wasn’t necessarily hungover, but definitely a bit tired and in need of a little reset for my face. If you’re someone who flies or parties a lot, I highly recommend this mask, because it is indeed super refreshing. Same thing if you spend a lot of time at the beach, this kind of feels like the cooling aloe gel you can aply on sunburns, but for your face. And you don’t need to have a sunburn. I’m gonna get one thing out of the way quickly, because it’s the only negative thing I have to say about this mask: I was expecting it to feel a lot more luxurious. There, I said it. $80 for a mask is quite expensive, so I was under the impression that the experience would be amazing, as well as the results. To me, it kinda just felt like the other jelly masks in this set. BUT, that being said, the results were definitely THERE. This is supposed to revitalize, lift, firm, smooth and refresh… And that’s exactly what I felt on my face after washing it off. To me, it compares to the Glamglow Gravity mud mask, except it’s much less expensive per ounce. I felt like my face was lifted, tight, and just looked overall 10 years younger. So yes, I basically looked like a teenager again, after one use. Now obviously the results aren’t permanent, (it’s a face mask, not magic) but I feel like if you do this mask on the reg, it can definitely really improve the overall appearance of your skin if you’re concerned with aging. I think this was the mask that gave me the most visible results in one use, and I can’t wait to use it again! I was a little scared to use this mask at first, because it contains AHA (alpha hydroxy acid), an acid that chemically exfoliates your skin to resurface the deeper layers of skin and eliminate the dead, dull layer of skin on the surface of your face (basically). Since I use Curology (full review here), I’m not supposed to use chemical or physical exfoliators, so I was a bit reticent… But I decided to try it anyways, for science, you know. Well, first, let me say the smell is AMAZING. I’m not a big pumpkin spice latte girl (actually I’ve only ever had one in my entire life) but this smells EXACTLY like a PSL and it made me so happy. Once you put it on your face, there’s definitely a tingle, and you can feel that it’s doing something. After wiping it off, my skin definitely felt like new and a little more glowing. I don’t think the difference was that breathtaking for my skin personally, because I already get a lot of chemical exfoliation from my Curology. But if you’re in search of something that will make your skin look refreshed and new, search no more, this it it! This is also one of the masks I was super excited about, because I just love anything with roses. To me, the rose is the ultimate symbol of luxury and beauty when it comes to nature. The first thing that hit me when I opened this mask, once again, is the smell. The beautiful smell of roses that you just want to slather all over your face. This mask is also targeting the signs of aging like fine lines and wrinkles, and it’s supposed to also help with hydration. I used to right after coming back from Mexico, and I can attest to it, it works. 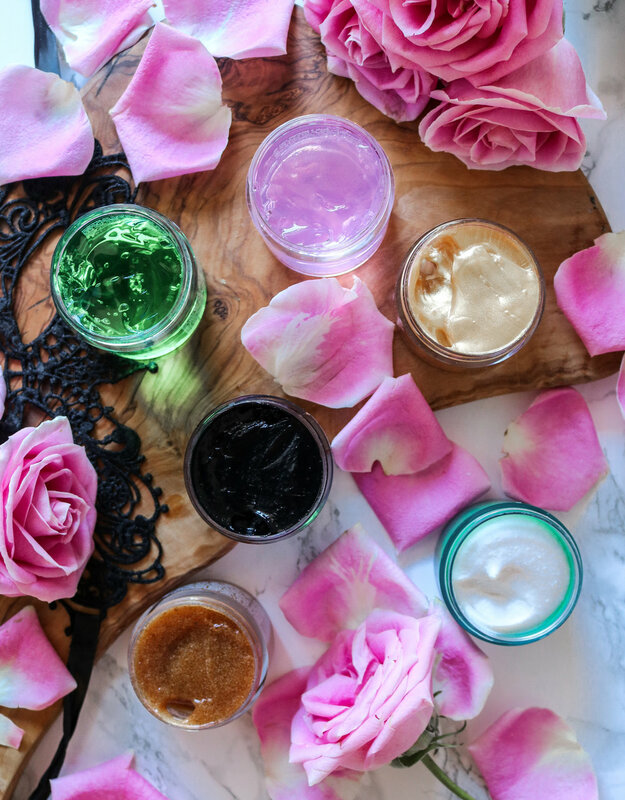 While it doesn’t lift and firm like the 24k gold mask does, it definitely makes skin look more… Rosy? Like fresh and plump and youthful, if I’m being specific. Since it’s a jelly mask, it’s also super refreshing, just like the cucumber mask. I also highly recommend this one! So, now that I’ve shared my thoughts on every single one of these masks, would I recommend this set? The simple, short answer is YES. I feel like this is an incredible gift for anyone who truly loves skincare, even if that means giving yourself a gift “To me from me” LOL. Jokes aside, those are the best gifts, right? I definitely love this set and just like when I bought and tried out Sephora’s highlighter set before the Holidays (full review here), I loved being able to test all these different masks and figure out which ones I would want to repurchase in the future, without necessarily spending a fortune. Aside from the Irish Moor Mud mask, which I will probably end up giving to my baby sister because I just don’t really deal with impurities and acne anymore, I feel like all these masks are great and do wonders for my skin, albeit being all very different. This is also a great set if you love multi-masking, since there’s something for every skin concern in this set. Should you want to buy it for yourself, Sephora is having a promo right now, and you get 2x the Beauty Insider points on every skincare purchase, until January 21st, so now is the perfect time to give it a go! Have you guys tried any of these masks? Would you buy this set? What’s your favourite face mask, do you have any suggestions I should try out? Please share in the comment section below, I always love reading what you guys have to say and interacting with you!